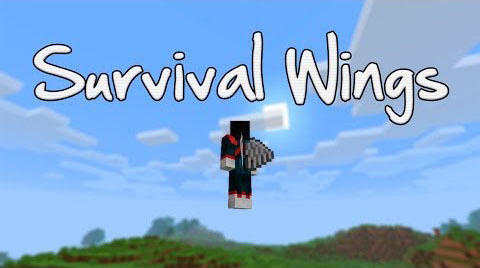 Survival Wings Mod adds craftable wings that let you fly in survival mode. They are equipped in the chest equipment slot, but offer very little protection. They also degrade the more you fly. However, there are a few different pairs available. In addition to the normal feathered wings, there is a set of obsidian wings which is much more durable, but also slower. ?Gluing? them together with netherwart results in a slightly less durable set of wings that flies at a normal speed. Surrounding them with 4 ender eyes increases the speed ? at the cost of a little more durability.